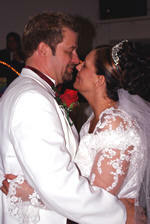 Eclectic Songs understands that your special day is one of the most important events in your life. We strive to provide the elegant and unique wedding entertainment that you and your guests will treasure. 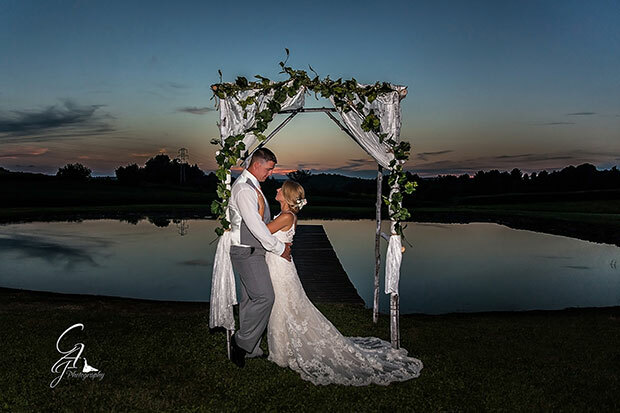 The key to your perfect day is all in the details and we are available to answer all of your questions from your first phone call down to the last dance. When you think wedding DJ, think Eclectic Songs. All of our wedding DJ packages are custom tailored to make your special day memorable and come standard with the following. ♥ There will be at least 1-2 in person meetings prior to your wedding (this is included but not required). ♥ Our state of the art sound system can accommodate up to 350 guests and has a wireless microphone for toasts and speeches (back up sound system also on hand). 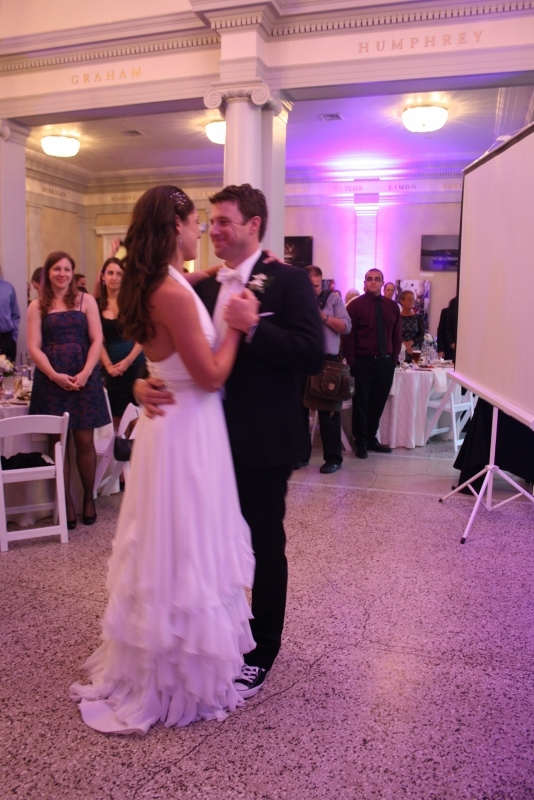 ♥ A polished and professional wedding DJ/Emcee and an associate wedding DJ in tuxedos to direct all of the festivities and make announcements. ♥ Music provided for the ceremony, cocktail hour, dinner, and dancing. ♥ Up to 16 Wedding Up/Accent Lights, Monogrammed Gobo Projector and an all LED & Special Effects Light Show. Pricing is determined by the type of event, time frame, options selected and day of the week that the celebration is to occur. Promotional Discounts are available. Contact Us for a Free No Obligation Quote! "Everyone had a blast! Linda was an absolute pleasure to work with from start to finish! She and her assistant Doug did a great job of reading the crowd while also sticking to our plans for our reception. Before the wedding, she gave us an extensive packet to fill out with whatever songs we wanted and with the traditions we planned on doing (cake cutting, bouquet toss, etc). She went over everything with us the week before to make sure nothing had changed and to learn how to pronounce all of our attendants' names. Her uplighting was beautiful and all of our guests loved her giveaways (which also made for some fun pictures). For all that she offered, her prices were fantastic! We would definitely recommend her to anyone looking to have a fun wedding while staying in budget. 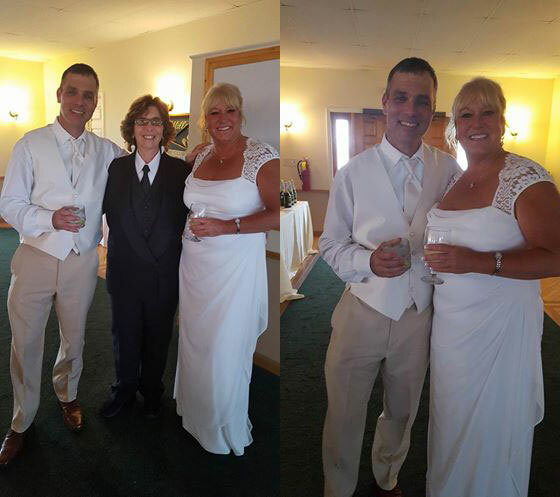 Thank you Linda and Doug for helping to make our big day so wonderful!" "The best DJ around! 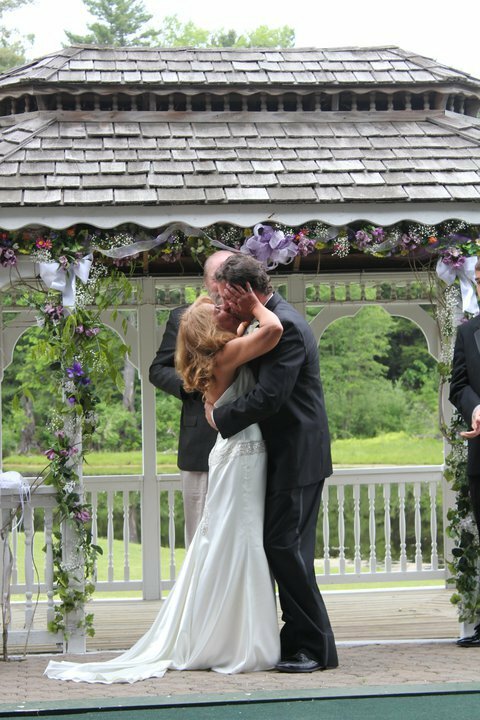 I can't even start to say how amazing Linda and Doug were at our wedding. She kept us incredibly informed and helped create a timeline for the wedding that actually made sense. She always answered questions and even met with us on times more convenient for us. I seriously can't believe how inexpensive she is for all that she provides, it's definitely a steal! The uplighting and customized name light were beautiful. And everyone loved the CDs that she made with our special songs on them. She even managed to find a few super obscure songs that we liked. We had a very eclectic crowd so it just made since to go with Eclectic Songs as our DJ, she made sure everyone was having fun." "5 stars are simply not enough for Eclectic Songs! 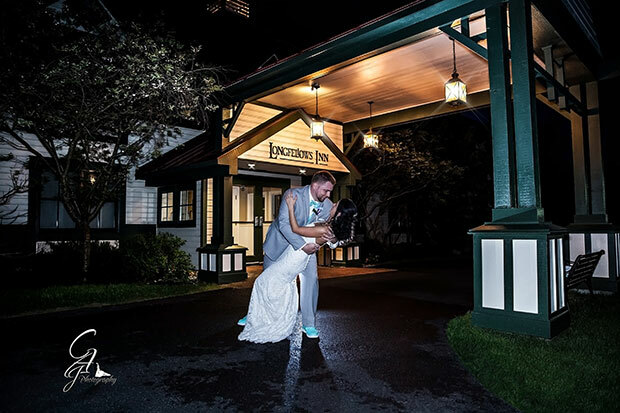 I recently had my wedding at Burlap & Beams in Athol NY (outside of Lake George) and after looking at all the DJs in the area I went with Eclectic Songs because they seemed to offer the most value for the cost compared to any other DJs I saw in terms of the price for the amount of hours and I am SO glad I did. Linda was SO on top of her game - she provided me and my fiancé with extensive materials to help us choose song options, and gave us forms to fill out so that we could do everything in our own time so we'd be all set for the day of. I was admittedly picky in that I wanted to pick all of the songs for all of the playlists myself and Linda said "It's your day! I'm here to do what you want and make sure it's perfect for you guys!" So she was very accommodating in letting us pick all the songs we wanted, but I'm sure if you didn't want to do everything yourself you'd still be in great hands just based on all the song lists she provided us of the most popular wedding songs for each part of the day: reception, ceremony, processional song, first dance, mother/son dance, father/daughter dance, and even bouquet toss (she gave us a hilarious recommendation which we would have never otherwise thought of for that which was to do All The Single Ladies while everyone gathered around for the bouquet toss then switched to Move B***h by Ludacris for the toss - our guests got a huge kick out of that! lol. She gave us a lot of other fun ideas like doing a newlywed game, the anniversary dance, and she handed out inflatable instruments and hats which ended up being a huge hit with our guests during the reception. She was so fantastic I honestly don't have the words, it really made the day. And bonus is she didn't MC like we were in a nightclub (huge pet peeve of mine)... I am so glad we chose Eclectic Songs, would highly highly recommend!" "Thank you so much Linda. It was an amazing night and Justin and I are so happy we went with you!!" "I could not say enough positive and wonderful things about Linda Terricola of Eclectic Songs. Our wedding would not have been as fun or as wonderful if she hadn't been our DJ. Linda is so great to work with. She is organized, professional, listens, and has great experience when it comes to DJing. She kept the party going all night, I've never seen people dance as much as they did at our wedding. The music was absolutely AWESOME and fit the mood of the reception PERFECTLY. She also was kind enough to provide the music at our ceremony site and made things so easy and stress free I didn't worry at all!! Her beautiful up lighting at our reception made our venue shine and become even more beautiful. She helped us have the wedding of our dreams and it was perfect. We love Linda!! You'd be crazy not to hire her for her skilled and awesome DJ services." 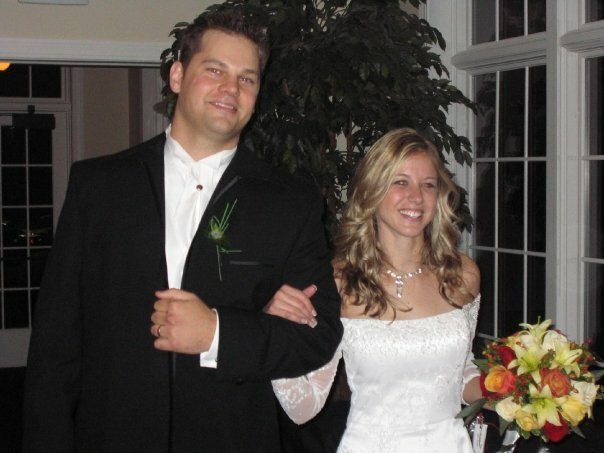 "Linda and Doug did a terrific job at our wedding. Always easy to get in touch with and happy to communicate any way we liked, text, e-mail, phone calls, etc. Linda provided us with a large list of common wedding songs which greatly helped us get started in picking our music. Volume and quality for our outdoor ceremony was superb, the microphone helped our guests to hear our officiant and our vows. Doug did a terrific job of effortlessly floating around the event capturing every moment on video, we actually talked about it later and realized we never even noticed he was there, exactly like you want a videographer to be. We are very particular about our music and sound quality; Eclectic Songs met our expectations in every way. When we walked into our reception hall for a sneak peak at the setup we were stunned. The up-lighting provided by Eclectic Songs was beautiful. Their LED lighting and lighting effects completely transformed the space, helping to make everything look even more elegant. The sound quality was top notch, we like our music loud and clear and it was perfect, loud enough to dance to and get lost in the music but not so loud that people around the dance floor couldn't have a conversation. Even the dinner music was the perfect volume. We had some specific sentimental songs we wanted played during dinner and we were able to hear them nicely in the background as we ate and visited with our guests. 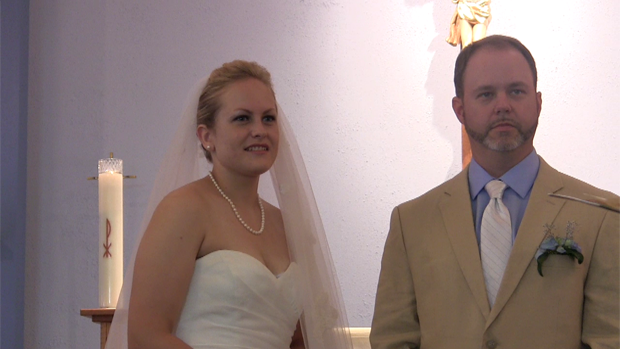 Overall we highly recommend Linda and Doug of Eclectic Songs for both DJ and videographer services. The amount of value for your dollar is incredible, they skip no detail, their setup for both music and lighting is beautiful and very modern, providing us with a great experience. 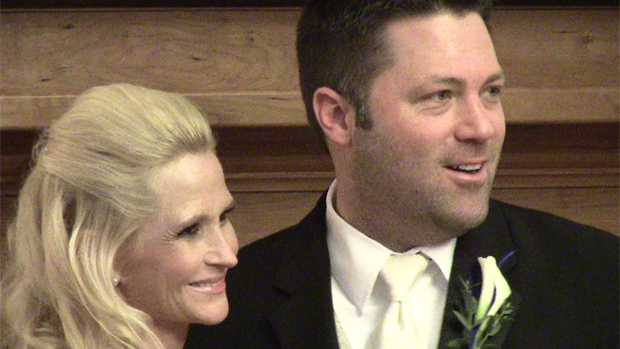 Doug's videography was terrific, never being obtrusive but always there for the important moments. They are willing to do anything you would like to make your day special. We are confident that anyone who chooses Eclectic Songs for their event will be very happy that they did." 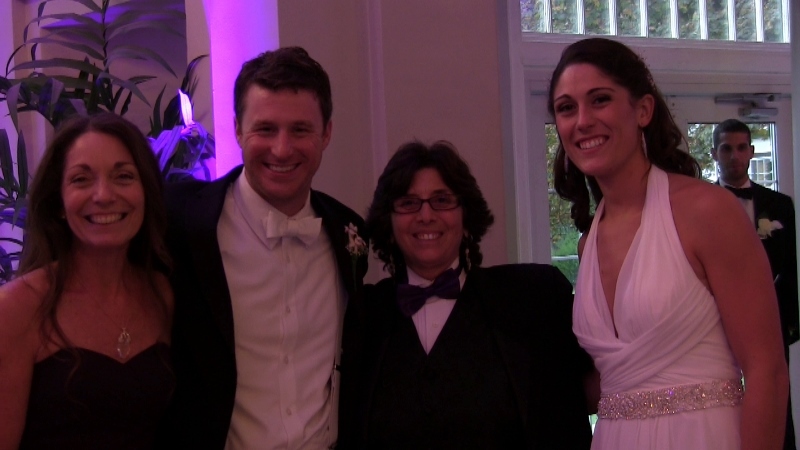 "We want to thank Linda Terricola and Eclectic Songs for their sensational addition to our wedding. Linda made sure she knew exactly what we wanted. She pleased our guests with lovely music for the ceremony and she played all the songs we requested during the evening. 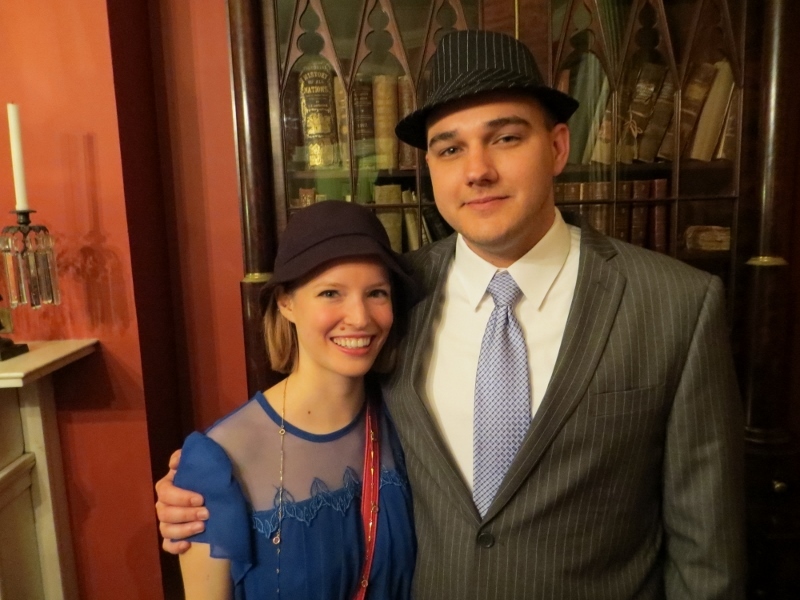 Everyone of our guests commented on how Eclectic Songs made our wedding night, tons of fun and full of happy memories. Linda mixed the music in such a way that everyone was able to participate. The whole evening was filled with music, laughter and joy. 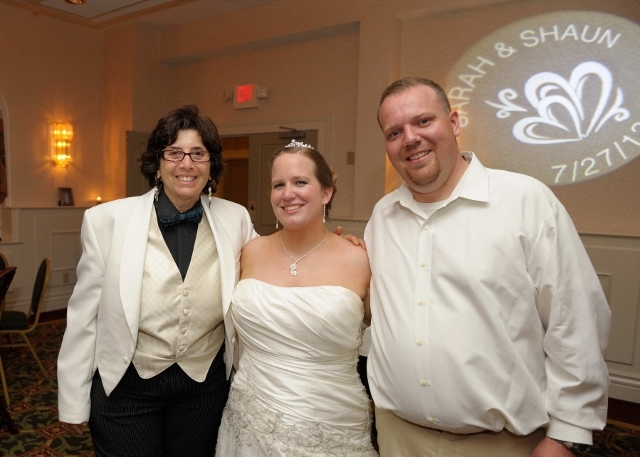 We are so happy that we had Eclectic Songs for our wedding night." 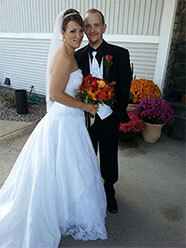 "We would like to thank you for the wonderful job you did as our DJ for our wedding. You were very organized and professional, as well as warm and friendly, a great balance that resulted in a wedding that our guests truly enjoyed. Anyone looking for a top-notch DJ service should look no further!" 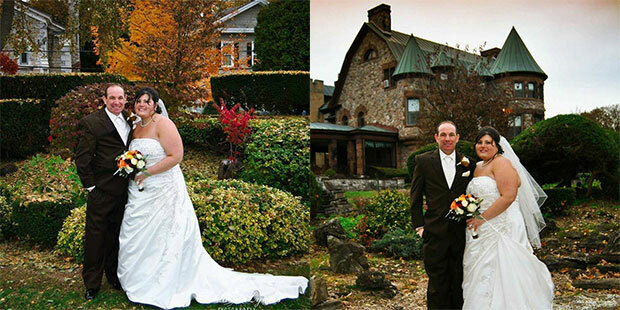 "We thank you for doing a superb job at our daughter's wedding held at the Casino in Saratoga Springs. It all went very well and we have lots of great memories already. Thanks again!" 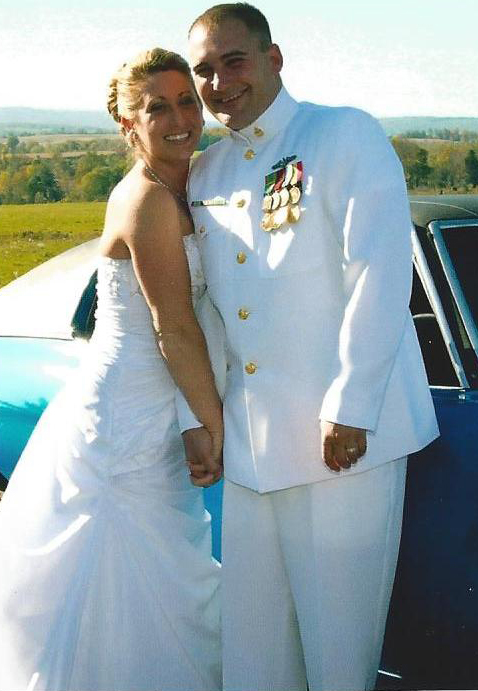 "My husband and I were beyond happy with the Eclectic Services. When we first met with Linda we knew she was who we wanted. 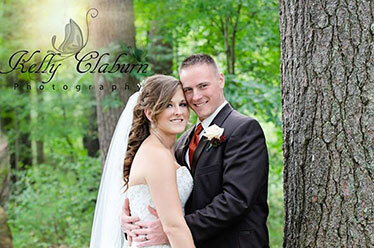 She was extremely professional, prepared and willing to work with us. Throughout the planning period Linda played an active role in helping even accommodate my guests with hotels in the area. Going above and beyond is an understatement. 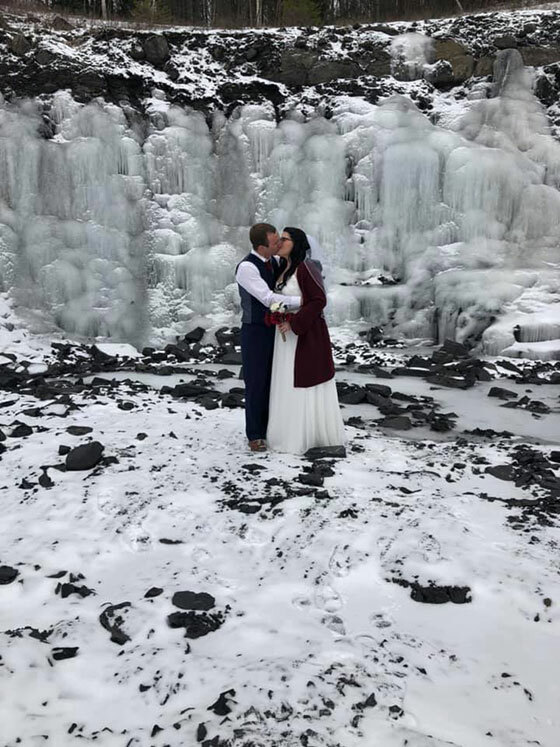 The wedding itself was phenomenal and Linda and Doug were both interactive and everyone commented and was impressed with the services provided. I can't find the appropriate words to show our appreciation and gratefulness for all that was provided to us, at an extremely affordable price! In addition to the props (blow-up guitars, sunglasses) used during the reception there C.D's passed around. A great piece of memorabilia for us as well as for our guests. Last minute my husband and I changed our mind about needing their services for a longer time period. Their flexibility was impressive and appreciated." "I could go on and on about how wonderful Linda is! She made our wedding day perfect! From the beginning, she was the most responsive vendor that I was communicating with. She went above and beyond to make sure our preferences were heard and respected...even if we were a little indecisive at times. Linda was prepared, on time, and the epitome of professionalism!! 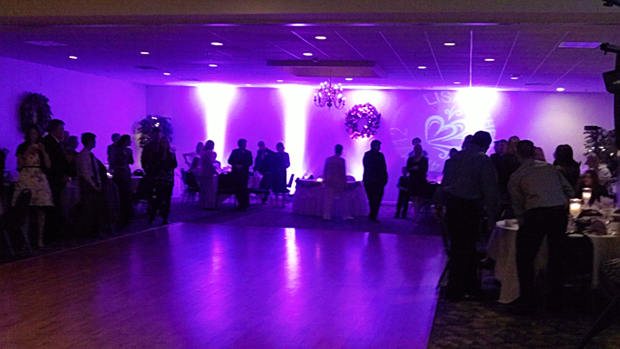 The complementary uplighting looked amazing and definitely contributed to the magical feel of our special day! Our guests had a wonderful time dancing the night away! Thank you, Linda! You are awesome :)"
"Eclectic Songs is a great DJ service. They made the event. The music and planned video were done with class and preparedness. This event was my Goddaughter's wedding held on August 30, 2014. They went above and beyond any expectations! Their wedding up/lighting was absolutely beautiful! Eclectic Songs provided their services for our daughter's wedding in 2006. It was their first event, we loved them so much we recommended them for this event. Linda and Doug have really grown in their professionalism and knowledge through these years of experience. If i had to say one thing...it would be they are over prepared, with songs, and names, and moving the crowd. I highly recommend Eclectic Songs for any event that requires music to keep the party moving. (Especially weddings)"
"We all know that the DJ will make or break your big day, and with Eclectic Songs, you can rest assured your wedding will be perfect! Linda and Doug were attentive to every need we voiced, and even anticipated the needs we overlooked. They created the spectacular wedding we deserved and desired, but never could have achieved on our own. Why worry about all the little details? From additional audio-visual needs, to light shows, and custom give-aways, Eclectic Songs will make any event, THE EVENT OF A LIFETIME. This may sound quite arrogant, but please believe me, I am typically a modest woman: Every single person who came to our wedding either called, or spoke with us in person to say that they had never been to a more magical event, nor a better party than our wedding. "While I would love to take the credit for this, there is no doubt that the event stunned even me. Of course a DJ is supposed to create atmosphere, but Linda goes above and beyond, so that you don't have to. In addition to getting the amazing perks, which include additional gifts (such as custom CDs of your special wedding songs for the members of the weeding party), you will also find the team of Eclectic Songs to be extremely professional, completely dedicated, and supremely talented!" "AMAZING! Linda and Doug exceeded our expectations. From the first conversation to the last dance of the reception Linda was professional and delivered what she said she would. Once on the dance floor guests of all generations never left the dance floor. Couldn't have had better experience." 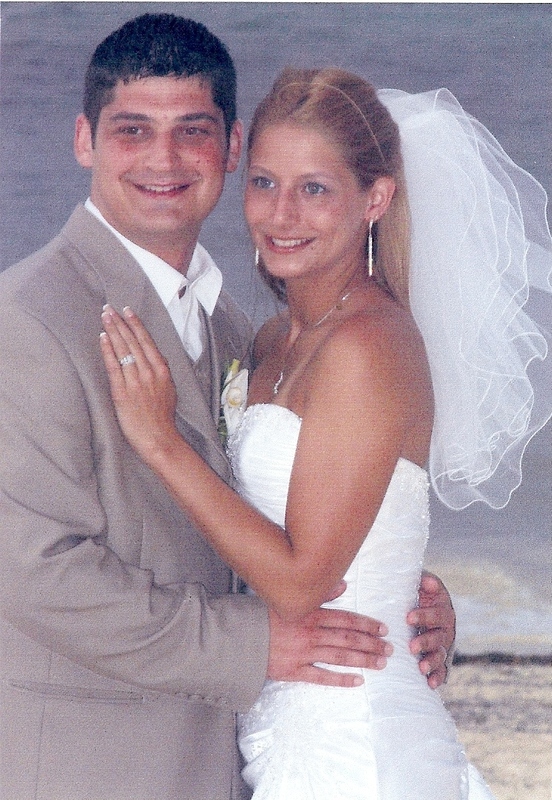 "Linda and Doug went above and beyond for us. Such professionalism. If you are considering someone for your upcoming event don't think twice about booking them, you will be so glad you did!!! Our dance floor was packed the entire night. All of our guests could not stop talking about what a great time it was. Linda and Doug truly care and helped make our day perfect!!" "Linda and Doug, Eclectic Songs are the epitome of professionalism! Everything was planned to a tee and carried out with us in mind! When the power went out, they were right on top of things with a battery back up to keep the music and good times going.. They never skipped a beat! If you are looking for top notch entertainment at a very reasonable cost, then Eclectic Songs is the DJ service for you!!! You will be happy you did!! " 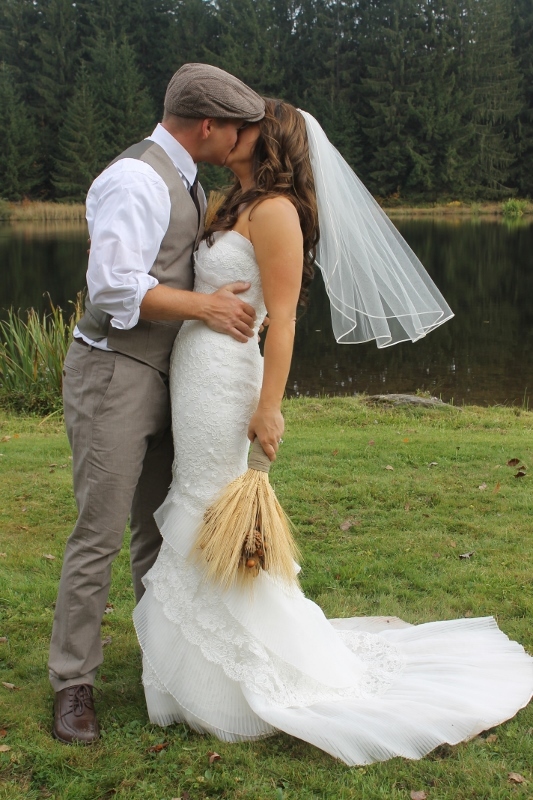 "We used Eclectic Songs for our wedding this summer and were so impressed by their services. They are professional, answer emails quickly, and do an amazing job. They listened to all of your music recommendations and everyone was up dancing and singing the whole time! Linda and her team make sure everything is to the bride and grooms liking. You cannot beat the value of this DJ and her team!" "WONDERFUL, I could not have been more pleased!!! Linda was very personable and professional. Linda and her team did an amazing job and kept everyone dancing the entire night. You will not be disappointed." "Linda was THE BEST DJ I could have hired! It is hard to pick a DJ and this was one of the biggest decisions I felt I was making and so much is dependent on the DJ for your wedding- they need to have the right dinner music, cocktail hour music and then keep guests dancing all night! I am so happy I used Eclectic Songs!!! Linda did all of those listed above- had the perfect dinner and cocktail music and then kept the dance floor packed all night! She played two fun games, which were great and guests loved them! (As well as Brad and I!) She had up lighting which was great! She also had our names and date of the wedding for the party on the ceiling! It was great! She had inflatables, hats and glow sticks to pass out to dancers as well, which definitely helped the party atmosphere. She for sure knew which songs to play to keep the guests on the dance floor! She was super responsive to any questions I had and when I made some changes just days before the wedding, she happily accommodated me! I had guests request not typical songs and she was able to get them at the wedding and play them! I did have a "do not play list" and when a guest requested one of them, she ran it past me for my approval! I cannot recommend Eclectic Songs and Linda enough. I have had so many guests say how great of a DJ Linda was- and I have to agree! Should I ever need a DJ again, she will be the first one I contact! Great job Linda and thank you!!!!"